Butterfly buttress in all of its glory. My pilgrimages north from Pembrokeshire to Liverpool began at the age of 14. My sister had, without the guidance of a magician, performed a complex vanishing trick which led to her reappearance on Merseyside. I would regularly visit her, hitching lifts with family, friends or even strangers, traversing Wales by a myriad of different paths, with all roads leading me to Bala, funnelling me to Ruthin, Mold and the industrial wastes of Ellesmere Port. One of my regular travelling companions loved the chemical complexes of Cheshire with their cancerous chimneys. As a former urbanite, exiled to a rural existence, he said that the scenes from "Blade runner" that flowed out in front of us polluting eyes, ears, and lungs in equal measure helped to construct his concept of home and sense of belonging. Suffice to say we don't speak anymore. It is around this time I became aware of the escarpment of limestone that crowns the valley above Pwllglas. As a fourteen year old it was simply a curiosity that interested the eye as we meandered past. However as Liverpool drew me in, firstly as a student and then as a climber, this scarp morphed into a place that needed investigation, somewhere where some sport may lie. However as I settled down in the North West my journeys through the Cambrian Mountains, up and down the Welsh backbone, dwindled and the limestone edge up at Pwllglas melted away as my attention was drawn by grit, rhyolite and sandstone. Over the next fourteen years I would occasionally pass through Pwllglas and rediscover a need to explore its potential only to ignore this impulse again and again. 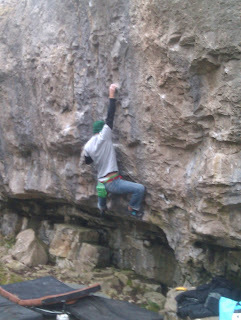 Linking one of the sit starts into Flatillary flake. A rumour pulled me back. 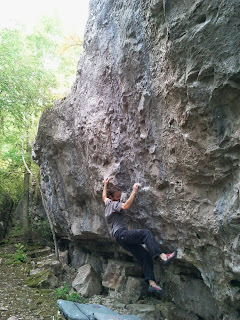 Loose words and tall tales got me fired up, potential lines in Clwyd! How could I resist? 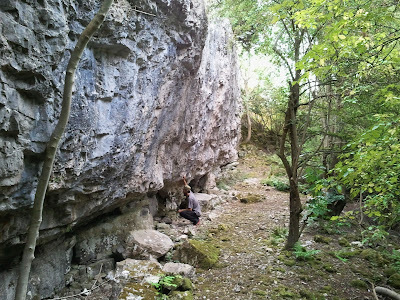 I hadn't made the connection between the crag spotted in my youth with these stories of unclimbed lines; whispers wafted like seeds on a breeze, passed imprudently from person to person until they took root in the ever-fertile depths of my psyche. All things being equal I wouldn’t have trudged up that Cambrian brow and laid siege to Pwllglas' potential had it not been for Angry Jones. Angry is a complex character misjudged by others. He's not actually angry; he just likes to paint his pictures of the world with a mallet rather than a soft delicate brush! His verbal pallet is wide but he likes the brashness of primary colours, short words with harsh syllables and big meanings. You know where you are with Angry, and if you don't he’ll make you aware of where you've ended up with the minimum of fuss. We set out for Pwllglas on a wet day with little hope and a scrap of worn paper to guide us. I had the briney goat-punctuated scent of the cave in my nostrils and dreams of projects in Llandudno's upside-down world in my mind's eye. 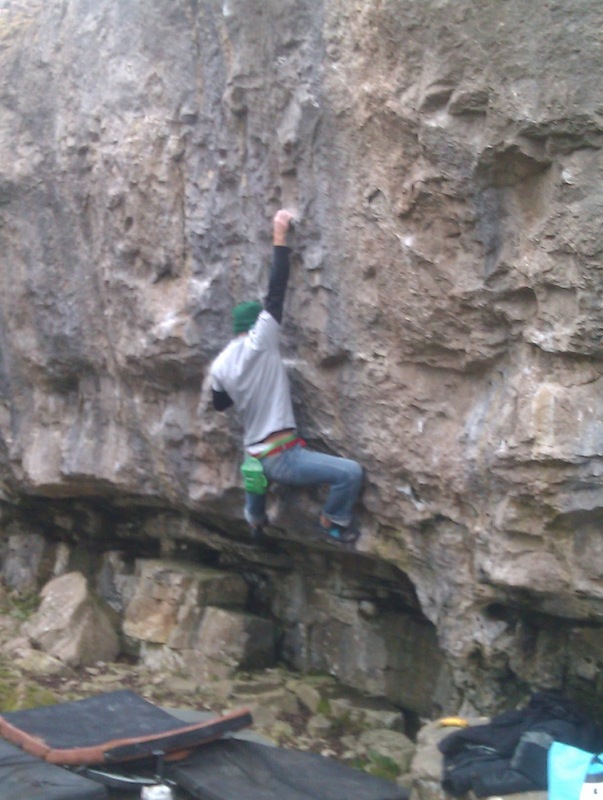 I felt that Clwyd's undulations were no place for a sane climber on a grotty day, Angry had other ideas. He explained in four letters or less why we should commit to the walk in, and I had nothing to counter his rather eloquent explanation. His motivational speech got us there and for this I am eternally grateful. As we trudged through the damp undergrowth and walked along the crags the rumours of potential seemed to morph into wet empty promises; but the overwhelming feeling of a walk wasted disappeared when Butterfly Buttress opened up in front of us. Butterfly Buttress is the reason to visit Pwllglas; it sits high above the valley like a Welsh Woodwell with vistas. The buttress is made of a compact, steep, sweeping limestone wall with an undercut base. Sit down starts and link up lines are the beasts you’ll discover here, lurking amongst Lee Proctors sport routes. Just like Woodwell roof climbs inhabit the same space as highballs, however the super-hard lines that set Woodwell apart are hard to find here. 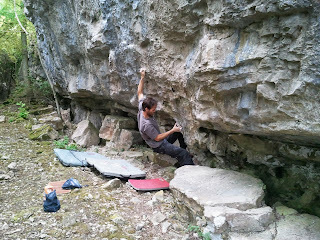 What you will find is quality on holds that will keep you coming back for more. One word of warning- ignore the grades we gave to these problems, they were ball park figures that, with subsequent ascents proved to be slightly inflated. 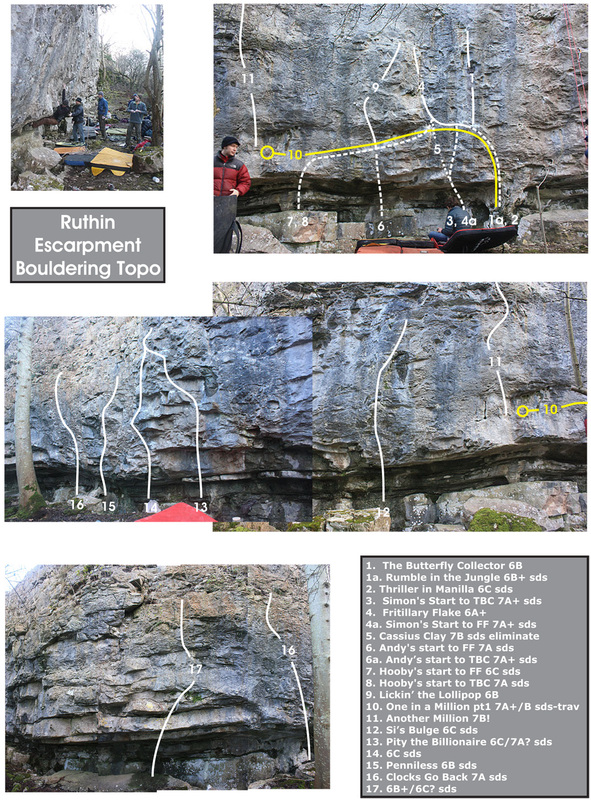 Others visited Butterfly buttress, left their mark, lifting the crag from its once esoteric status to a venue worth visiting in its own right. Even the legendary Ben Showtime Farley graced the crag with a visitation, displaying his silky skills and flawless technique on more than one occasion; this fact alone must conclusively confirm Pwllglas to be a limestone crag of some merit. 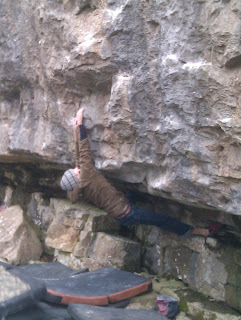 Alec pulling shapes on the Butterfly collector. Many things of little significance to most have occurred on that hill on the edge of the Clwyidian range. Angry fell in love, a love that could not transcend the duel barriers of species and gender! Fletcher the Lurcher, all legs and affection, was rescued by Andy and introduced to the outside world on that limestone hill. Manchessie became a hero, rescuing me from certain breaks and embarrassment as I plummeted from the top of the crag whilst topping out on a jug that just wouldn't stay put. I had enough air time to plan which limb I would sacrifice, I also yelped like a little puppy as the ground approached (why be manly about it?). I think if you’re going to hospital its best to display your vulnerability before anything major happens, it helps the professionals know what they are dealing with. There is no point being brave, your frailties will only be exposed later on. I escaped unscathed, Manchessie however was bruised, battered, and out of climbing for a week after his instinctive intervention. The scouse crowd also adopted a new member under the shadow of the Butterfly Collector, however I’m sure Alec would sprint for his VW camper if he knew he was now considered one of us. Smooth Pete almost lost his thumb when he decided that this extremity would be the most elastic, forgiving thing to land on from height. 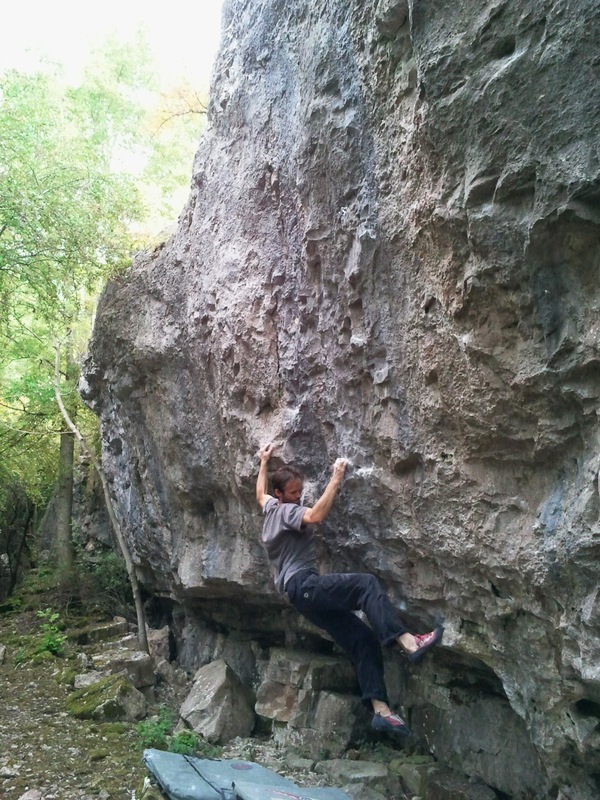 Manchessie, in the quest for new lines, regularly removed rocks from the buttress like the quarrymen of old looking for building materials and again injuring himself in the process. It has to be said that days at Pwllglas are never boring. It's worth the effort to walk up to that last gasp of the Cambrian Hills and sample the climbing; believe me it will draw you in. Ruthin Reloaded - Pwllglas Project Finally Falls. Pex Hill - problem of the week!